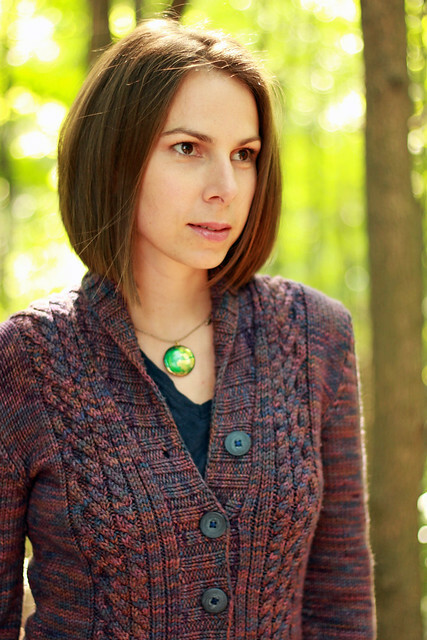 My I Heart Cardigans pattern is now available! I had this sweater all done and 99% ready before Rowan was born. 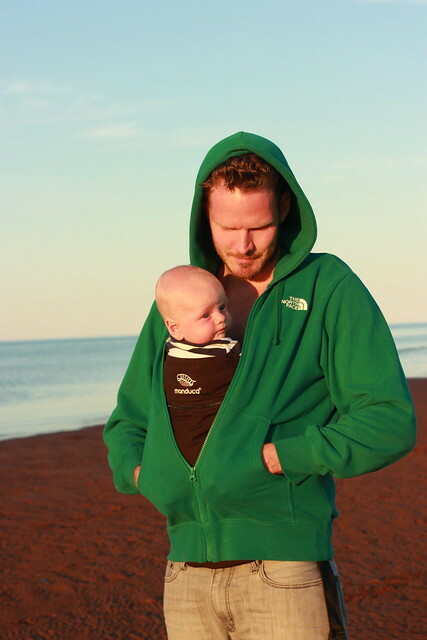 In fact, I wore this sweater to the hospital the day I gave birth, it will always be my favourite sweater because of that. But then came Rowan, and right then and there the final 1% that needed to be wrapped up in order to have this pattern ready for publication got majorly delayed. But, here we are, just in time for every knitter's favourite time of year, fall sweater weather! 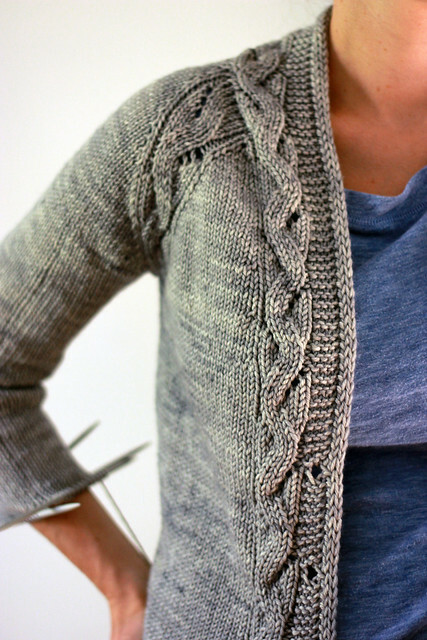 This cardigan is very heavily inspired by it's older sister, the I Heart Aran pullover. I love my I Heart Aran, but sometimes you just need a cardigan! The pattern has the same densely cabled look (though the cables have been switched up) the shawl collar and the classic set in sleeves, but now in a fabulous cardigan option. Whereas I Heart Aran featured a plain stockinette back and was knit in pieces, this cardigan has lots of action in the back and is knit in as few pieces as possible. The body is knit flat in one piece and then divided for the fronts and back at the underarms. The sleeves are knit from the bottom up in the round and then knit flat for the sleeve cap shaping. Just a couple of seams to pull it all together. I knit this version in a one of a kind colour way that is quite close to Truffle. I know it's frustrating that this exact colourway isn't available, but I've got good news! There will be an Etsy Update on Tuesday, Sept. 3rd at 12 noon EST featuring lots of sweater quantities of both Green Label Aran Weight yarn and Orange Label Cashmere/Silk Worsted Weight yarn for you to knit your very own one of a kind I Heart Caridgans. More details about the update on to come. Yarn: 6 (7, 7, 8, 9, 9, 10) skeins Tanis Fiber Arts Orange Label Cashmere/Silk Worsted Weight yarn or Tanis Fiber Arts Green Label Aran Weight yarn. Needles: 4.5mm and 5mm needles circular. same size dons for sleeves. Additional Tools and Materials: 8 Stitch markers, waste yarn or stitch holders, tapestry needle, 8 - 1" buttons. If you follow me on Instagram you'll know that we're working towards an Etsy update soon! I'll be posting all the details here and everywhere as soon as I figure out exactly when we'll be listing all our newest one of a kind gems. Probably next Tuesday, but that's not official yet. We've tried something that we've never done before, we dyed a bunch of colours using the same undertones and then submersed them into different coloured dye baths. That method is the same as we always do, but experimenting specifically with the same few colours is something different. The results are incredibly enlightening. 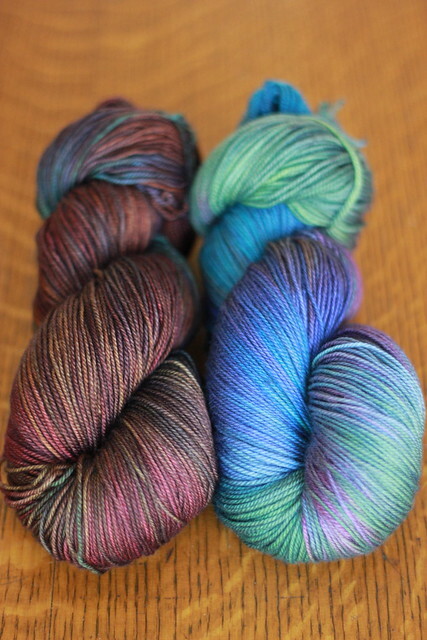 Can you believe that the two skeins pictured above started off looking exactly the same? Then the one on the left went into a chocolate dye bath while the one on the right went into a periwinkle dye bath. Amazing. Both are stunning. Two of my favourites from the update. What do you think? Yarn: TFA Green Label in Lucky Penny. This is an exciting project for me. 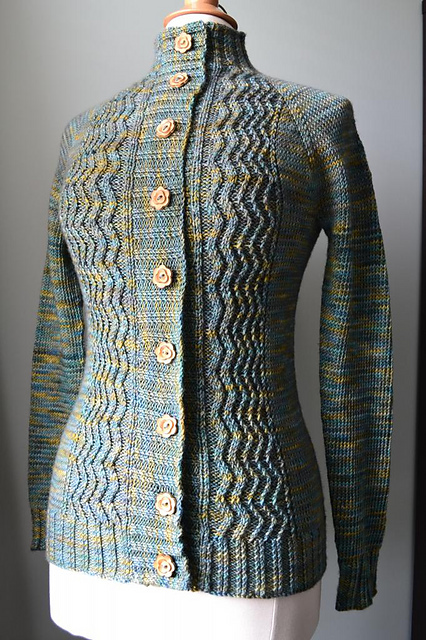 My original Reverb cardigan was knit in the lovely Brooklyn Tweed Shelter yarn. When the pattern was published I secretly hoped that someone would knit a version in TFA Green Label. Melissa (aka: Prairie-Knitter) has done just that! But she's taken it one step further by knitting it in one of my newer colourways, Lucky Penny. 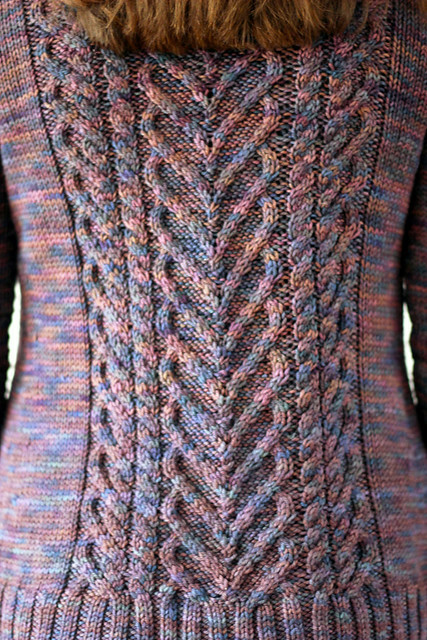 It's always exciting to see such gorgeous projects pop up on Ravelry in new colourways. Rumour has it Melissa has a pile of another new colourway, Iris, sitting around waiting to become something awesome. Can't wait! 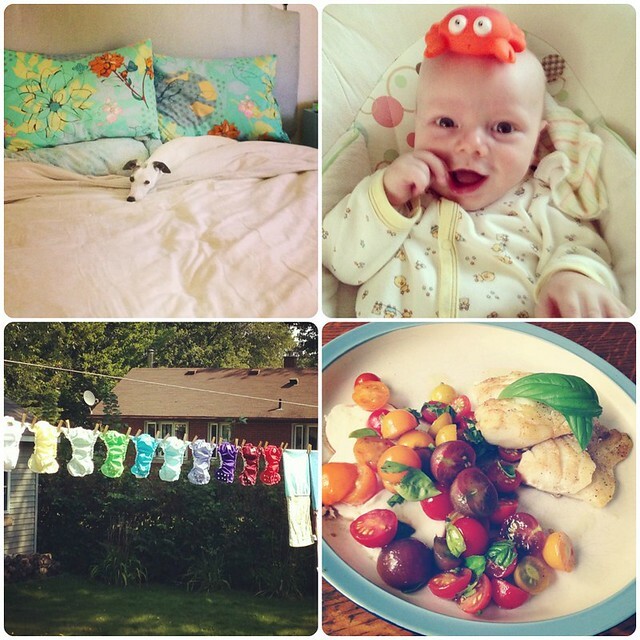 I'm on Instagram! You can find tanisfiberarts right here. I am very new to this instagram world. I'm not the type of person who carries my phone with me everywhere I go, so I'm not in the habit of seeing something and then immediately thinking that I should pull out my phone and instagram it, so I'm not sure how busy my feed will be. Though there will definitely be knitting content on there I expect that it will also feature lots of non-knitting content as well *cough* Rowan pics *cough*. So if you'd like to check me out, see photo's of things that I think are nice and that I apply cool instagram filters to, then come and join me! 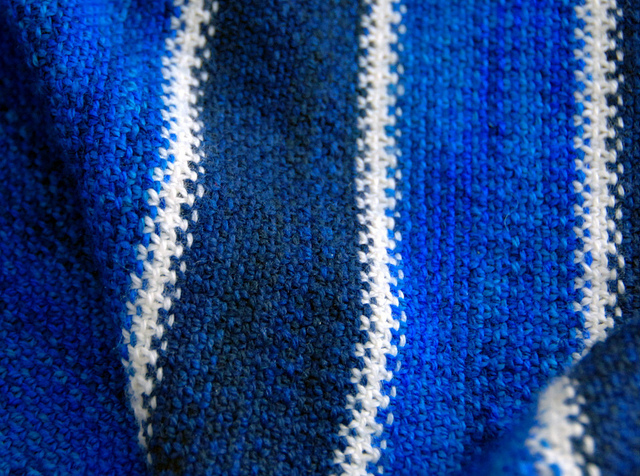 Yarn: TFA Blue Label in Natural, Midnight and Cobalt. 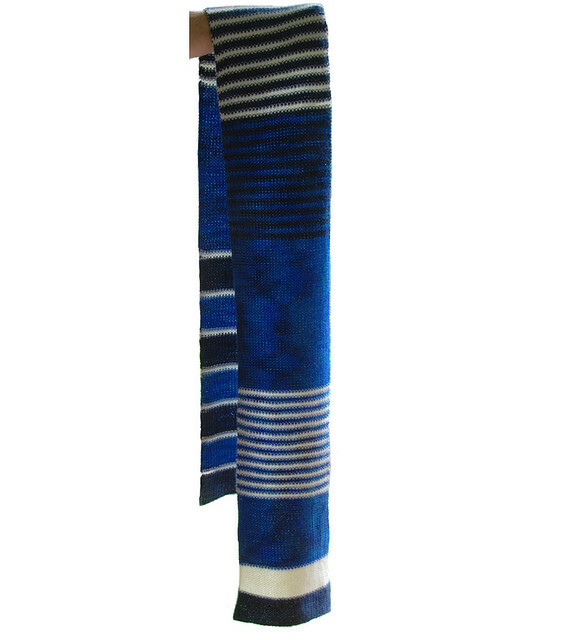 This scarf is especially neat for two reasons; the first is that this clever knitter took a lovely linen stitch scarf pattern and turned it 90 degrees to make the stripe sequences run bottom to top rather than side to side. Second, the stripes are asymmetrical, gotta love asymmetrical knits that don't follow the rules! And third (I know, I said there were only two reasons but really there are three!) 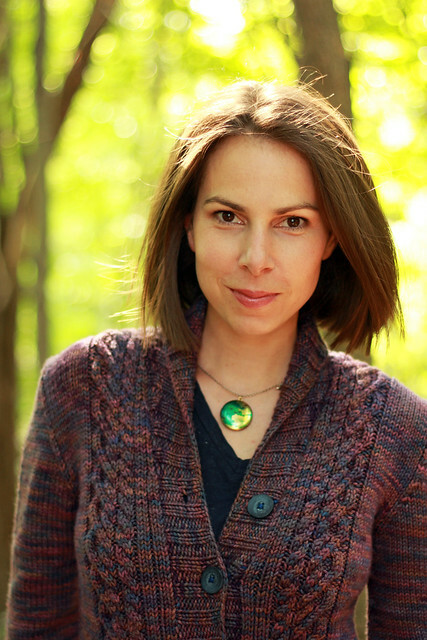 the third and most cool thing about this scarf is that it was knit for a really interesting project that paired Canadian knitters with Canadian authors, challenging the knitter to create a knit that reflected a given book. Read more about the FictionKNITsta project here, and see this scarf in action at an event here. 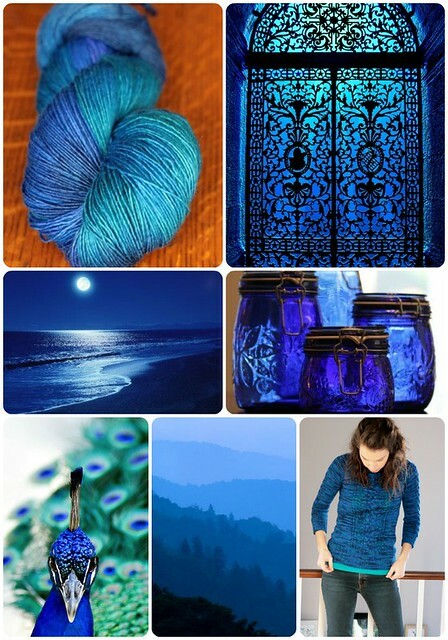 Clockwise from top left: TFA Red Label Cashmere/Silk Single in Cobalt, stained glass, glass jars, tanisfiberarts' Cobalt Julissa, forest skyline, peacock, night beach sky. Rich, saturated, blues! Potentially my favourite colour... but then again I say that about every colour. This time I mean it! I've got a few patterns in progress these days, some closer to being released than others (this one will be ready any day now!) I should be finished knitting my Lady Sunnyside just in time for cool evening strolling season. I can't wait! I'm knitting mine in Orange Label in the perfect Chris Grey colourway. Enjoying some quiet time in the shade. 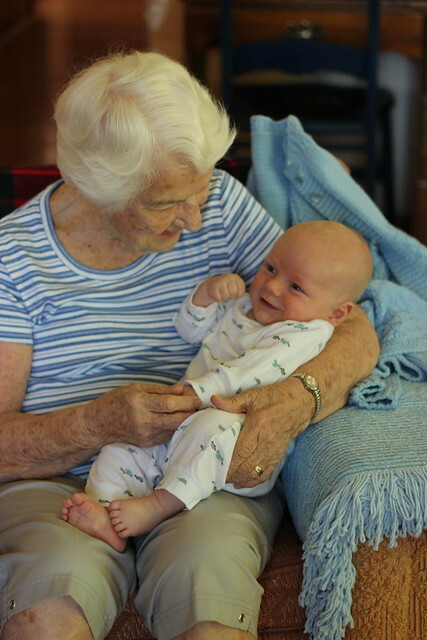 Meeting his great grandmother "GG"
An evening stroll on the sandbars. 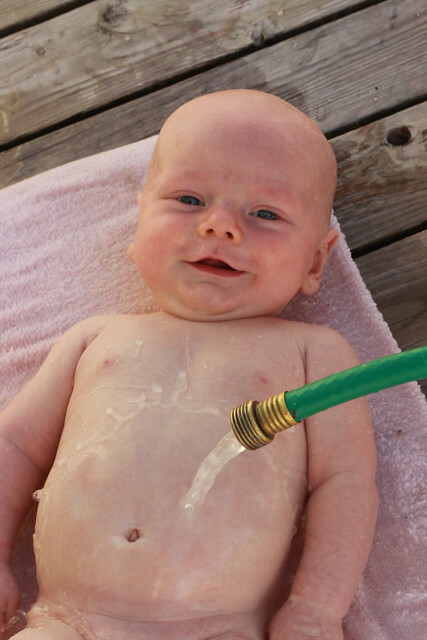 A cottage style bath... with the hose! Rocking chair, sunset, sleeping baby... heaven. Our time out east this summer was wonderful. 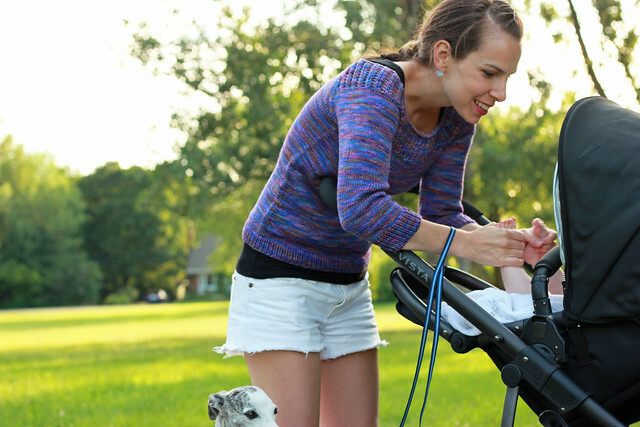 I think that there is nothing better than raising a baby surrounded by family. There was always someone there to help cuddle Rowan when he needed it, or to keep me company when I was on hour number 2 of walking around the cottage with a fussy baby (Rowan's awesome, but all babies have their fussy moments right!?) For the first time ever I took a ton of photos while on vacation this year, and guess what, Rowan is in just about every one. Here are just a few of my favourites, there are many more but I thought I'd be kind and share just these 5 today. Modified Gemini - an FO! I'm back from vacation! I bet you thought that I had just up and left for good. So sorry about the total lack of contact I've had with the blogosphere over the past few weeks. Vacation mode set in pretty hard there for a while. It was awesome and I'll tell you all about it another day. 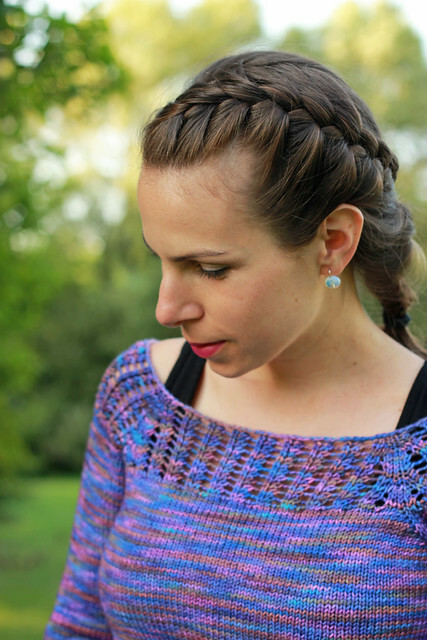 For today, I'm back home, back to work and I have a long overdue FO to share! 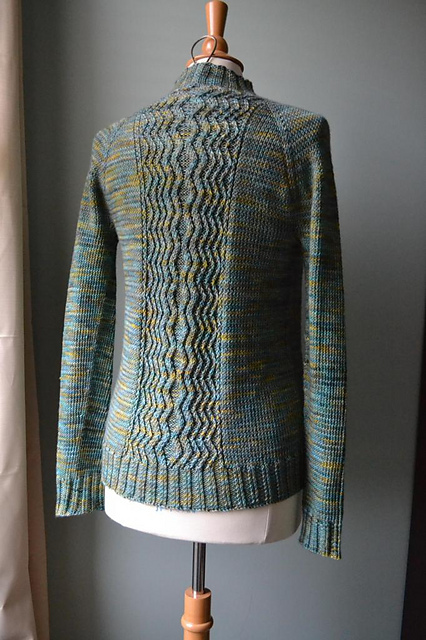 Pattern: Gemini by Jane Richmond. Yarn: TFA Yellow Label DK Weight yarn in Iris. Voila my Modified Gemini. 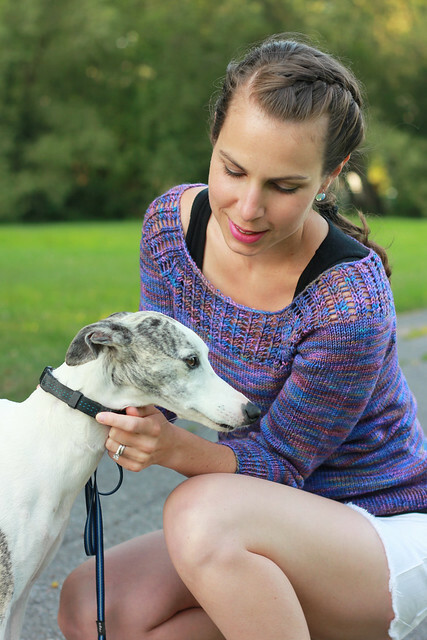 I modified the original short sleeved summer top following Jane's very own mods as detailed on Ravelry. I am thrilled with the results. My version doesn't fit around the neck quite as I had expected. It seems that on most people the neckline is a crisp square, whereas mine fits more like a wide, off the shoulder number. Not what I had in mind, but still lovely and fitting with the design. I find that it adds an element of casual cool to the sweater, and that's totally fine by me! I am crazy for how the Iris colourway worked up. I love the colourway in the skein, and I have already used it for a pair of awesome socks, but knitting a larger garment in a colourway with a good amount of variegation can be tricky. I alternated skeins every 2 rows, kept a close eye on how the colours were falling, and in the end I think that the sweater is rich and colourful, but not stripy and crazy multicoloured. It still reads as purple, but upon closer inspection it's got little bits of everything. That's what I love. The only thing I wish I had done differently is pick a different spot to alternate skeins. When I cast on I began alternating skeins at the beginning of the row, which falls right smack dab in the center front of the sweater. Lesson learnt, don't do that. Once I noticed that I was getting this weird line where the switch was occurring I moved the transition point over to a raglan marker where the steps are much less noticeable. I can live with it the way it is now, though I always have to wear the sweater backwards. In the photo above can you see how there is a bit of a line down the top of the center back? It's not so bad on the back, but would look awful if I wore the sweater with the solid portion in the front. I won't make that mistake again. Overall I'm thrilled with this sweater. Thanks Jane for such a great pattern!